Micro / Mini / Apple Compatible 3-in-1 Retractable USB CableThe 3-in-1 retractable USB Cable from I/OMagic combines all of the most commonly used cables on the market into one compact design that will save you time, space, and money.Perfect for both mobile and desktop users, once you plug in this cable you may never have to plug in another cable again.This cable provides charging and data transfer for Micro-USB, Mini-USB, and Apple 30-Pin devices.What does that mean to you? It means that you don't have to bring all those cables with you anymore. 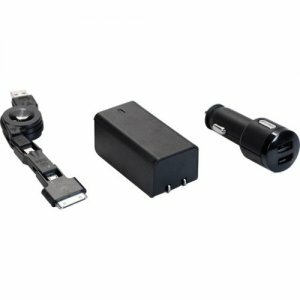 It means that you don't have to buy them, you don't have to look for them, and you don't have to untangle them.Combine it with our USB Car Charger and safely charge all of your devices while you're on the road.